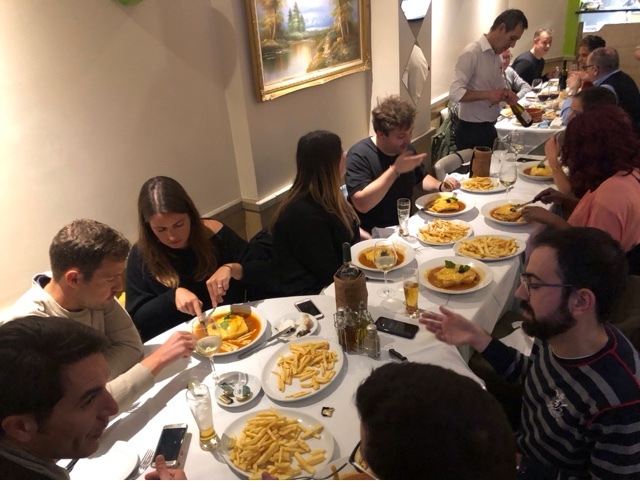 I spent last friday evening celebrating Francesinha friday (it’s not a thing so dont go checking your calendars) at a Portugese restaurant in Stockwell called Barros with my work crew, most of which happen to be Portugese. You might recognise a few of them from my Portugese BBQ World cup blog post. This was a visit to introduce me to possibly one of the best sandwiches on the planet according to the Portugese and Anthony Bourdain. Before I get into how the evening went, this wasnt my first ever visit. I visited this same restaurant a few months prior and what struck me on entering the restaurant was the fact it felt like you were in a totally different country. I remembered thinking this was a Brexiteers worst nightmare. Everything with the exception of a plaque on the wall that said “christmas” and the menu was in Portugese. Something else that struck me was the customer service. I was prewarned about this prior to entering I have to admit. The waiter basically just stares at you if you dont speak Portugese , speaks to your Portugese friend, looks at you again with a snarl, then goes off to get beer and your meal. Apparently the disinterested look is part of the charm. I plan to break the ice by asking the waiter how he is in spanish..on second thoughts he might just empty the clams on my well shaven scalp so maybe not. The third thing that struck me on my first visit was how flavorful all the dishes were. It was tasty home cooked meal at its best. 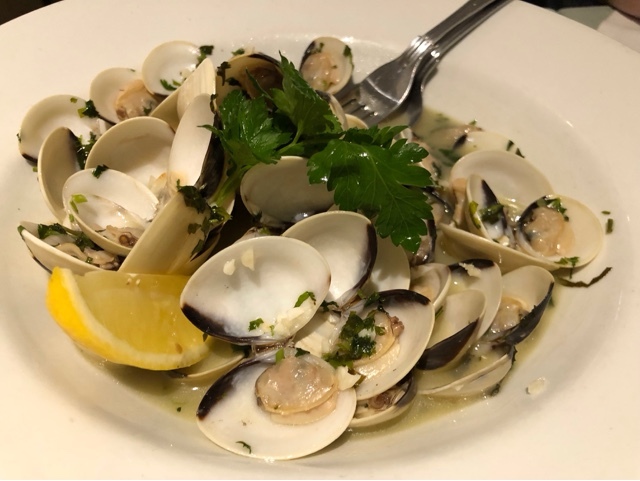 We had clams and grilled chorizo starters. 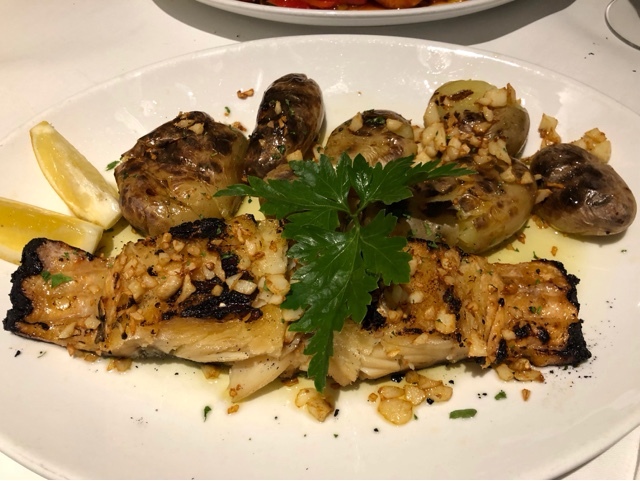 The starters were soon followed by two salted cod dishes known as Bacalhau. 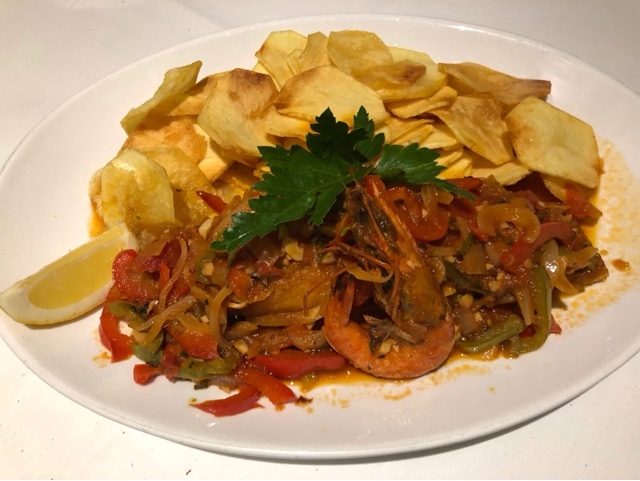 One was simply grilled with some of the tastiest and crispiest potatoes i’ve ever had, whilst the other was served with garnished peppers, onions, king prawns and fried potatoes. I’m actually drooling thinking about this. You need to order these dishes if you ever get to visit. 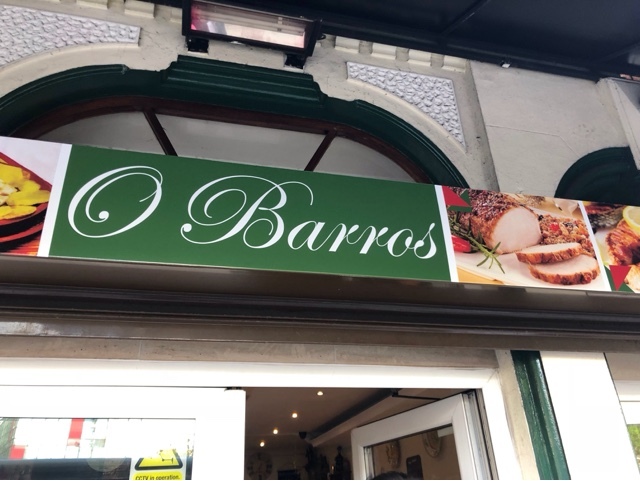 My first visit was a success , as such when I heard we were going back I pretty much looked forward to stuffing my face with more portugese dishes. 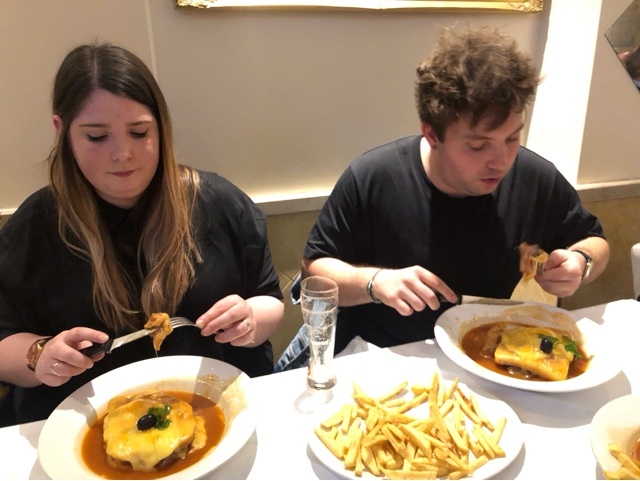 The only thing I was prepared not to do was to get absolutely wasted in a hole in Clapham after the meal, however as luck would have it Marina was shattered from doing on call. When we finally sat down , we spent a while chatting about work , whilst munching on enough bread and canned fish pates to feed 500. If Jesus actually casually strolled past us, I wouldnt be surprised. There was that much bread and canned fish pates. I should add that it tasted heavenly (mind the pun). As I was munching down on the bread, I ordered a glass of beer in Spanish and not Portugese. 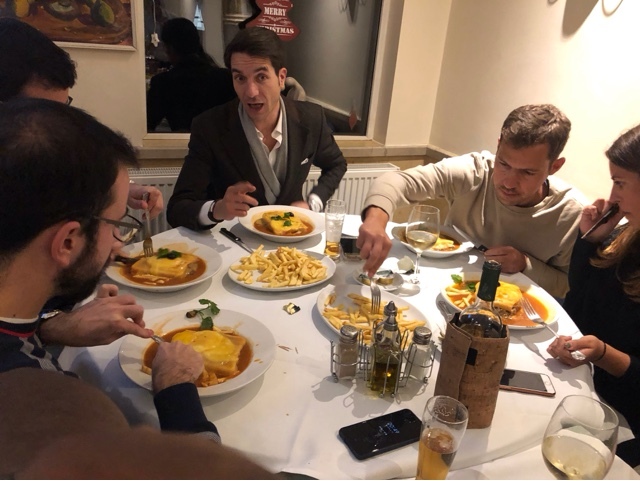 Paulo choked on his food at this point and went into a monologue about how I was an evil incarnate.First rule of hanging wth Portugese people , dont attempt to speak Spanish. It’s just not worth the stress. 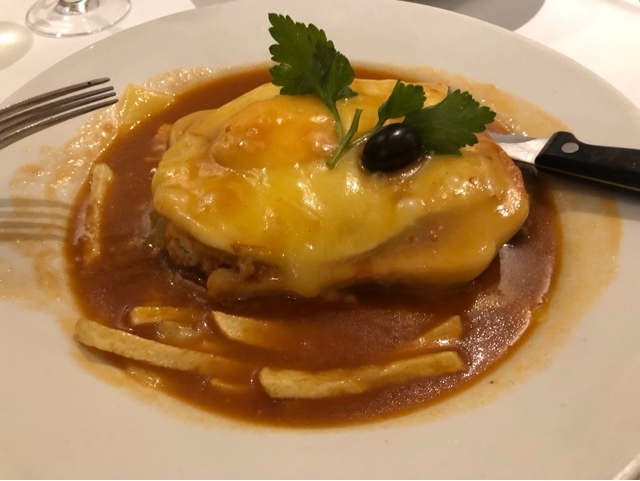 After a while, the Francesinha’s arrived and as soon as everyone was about to get tucked in , there was a quick story about the dish from Paulo. 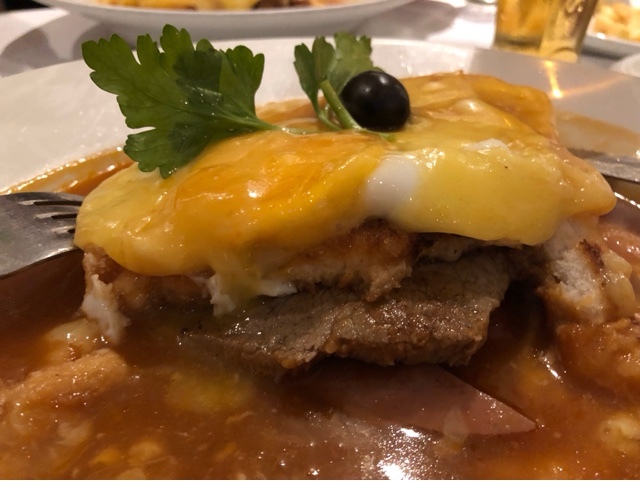 So what’s francesinha I hear you ask?..well in summary think of it as a catastrophic heart attack on a plate that’s quite popular in Porto. 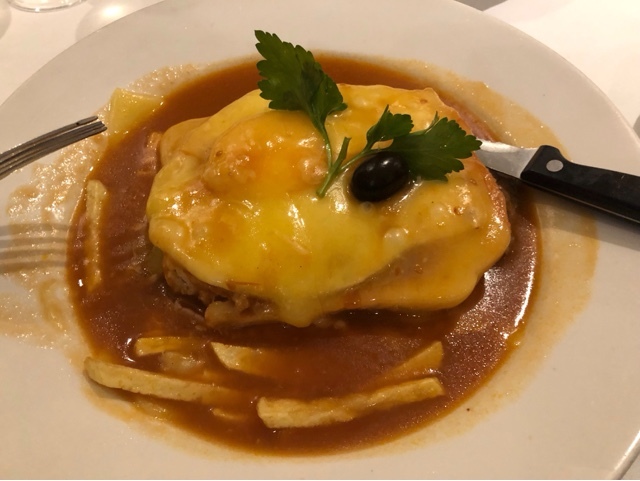 I nearly had a bet about finishing two Francesinha’s but after seeing the stuff I wiped my eyes and quickly came to my senses. 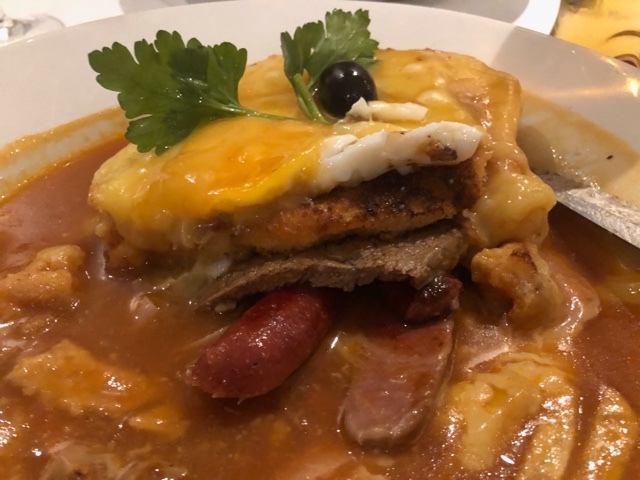 The dish is a toasted sandwich with beef, ham and chorizo covered with melted cheese and fried egg swimming in spicy sauce. I decided to cut up the dish a little to get a better picture of the insides , so hope you enjoy the pictures in all it’s heart stopping glory. Have often heard about how this sandwich was one of the top 10 sandwiches on the planet and I can see why this was the case. It takes everything you love about sandwiches and amplifies it by a million. I liked it , however it took me a while getting over it’s richness. I was told to dunk some fries into the spicy sauce and I have to say that this was quite good advice. It was a struggle finishing the dish and i’m probably blaming that on the truck load of bread I ate earlier on in the evening. I should add that 9.50 for this dish isnt a bad price at all. On finishing the meal we had a few more drinks and headed home very satisfied. There goes my friday evening at Barros. Tasty food at affordable prices. 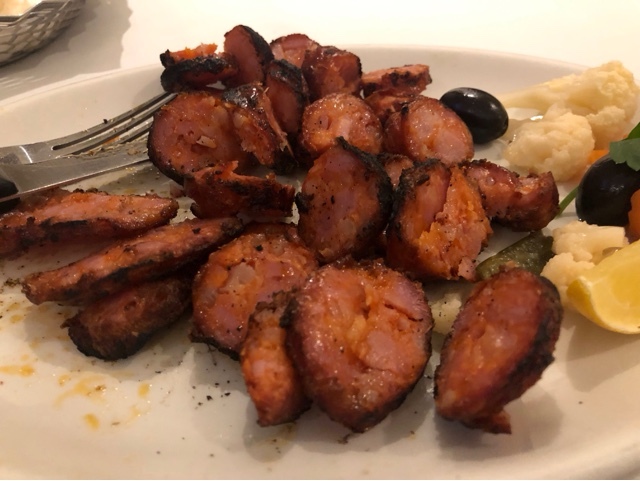 Leave a comment if you have recommendations about other Portugese restaurants.